This came yesterday! (Sorry, it was the usual insanity around here, which is why I'm posting now!) The boys came home from school and youngestSmacks looks at the little packing slip with the sender's name. He asks, "Do I know her?" I said, "No." He says, "Well, Mom, tell her I said thank you from me an' my brother." My 11 year old just looked very happy and asked if that meant I'd make "the good bread" again (I use the quinoa flakes, ground flax seed, and unsweetened shredded coconut to give the GF bread a better texture). When I said yes, he did a goofy pretend-faint and looks up at me from the floor, saying, "Grilled cheese!" over and over (thanks again, CG, for the goat cheese!). 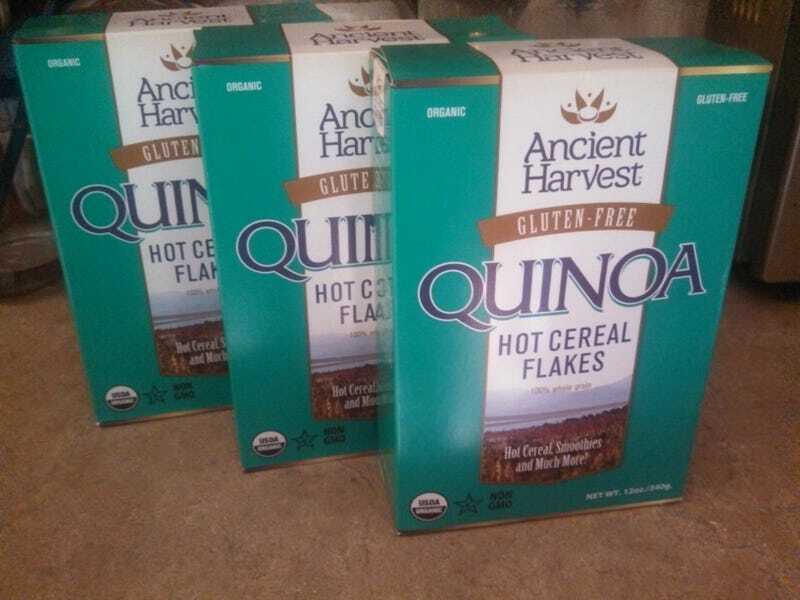 I use these in cookies, in bread, as hot cereal, in homemade granola bars... they're so good!